Product #3972 | SKU BETA56A | 0.0 (no ratings yet) Thanks for your rating! 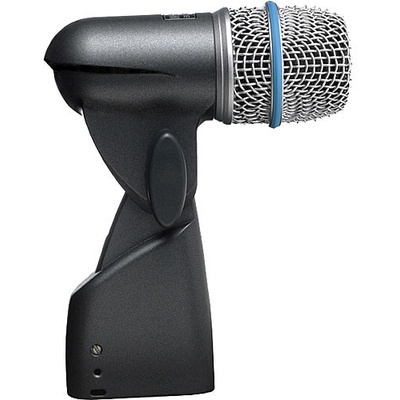 The Shure BETA 56A is a dynamic super-cardioid dynamic instrument microphone designed for general instrument recording and sound reinforcement applications. The microphone features a tailored frequency response custom made for capturing toms, snare drums, guitar and bass amplifiers, brass, woodwinds and more. The BETA 56A features a super-cardioid polar pattern which rejects audio around the off-axis sections of the microphone. This ensures maximum gain before feed-back while minimising noise and audio at the off-axis sections of the capsule. The capsule's Neodymium magnet provides maximum audio gain while providing a very low noise floor. A built-in stand mount provides quick and easy microphone placement. The tailored frequency response make the microphone more than suitable for toms, snare, brass, woodwinds, guitar and more. The super-Cardioid polar pattern delivers the highest possible signal before feedback while minimising noise at the off-axis sections of the microphone. The Neodymium magnet delivers higher gain levels than that of standard element magnets. Output Impedance 150 Ohms (290 Ohms Actual) for Connection to Low Impedance Microphone Inputs.